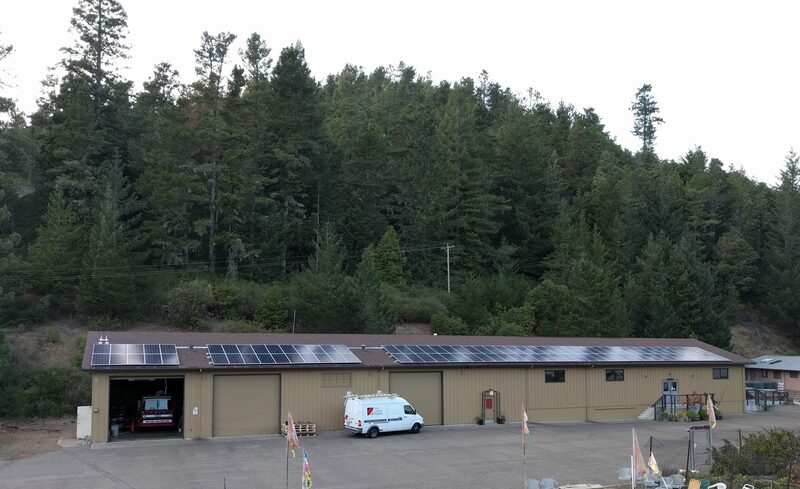 There are now panels stretching out along most of the south of east-facing roof of one large building, and for many months these panels will generate enough power to run everything, plus earn enough credits with PG&E to carry us through the darker winter months. We feel very fortunate that conditions came together to make possible another small step to reduce reliance on fossil fuels. We had discussed going solar since 2005, but only this year did everything fall into place. After many months of research considering various design proposals and quotes, we selected Sun, Light and Power of Berkeley to work with. At our Buddhist retreat in the spring, the community and friends were invited to support the project through making donations or loans for a system that would cost around $101,000. Within six months we raised over $75,000. Sun, Light and Power designed a 30.72 kW DC system, which they then installed in three days in October, shortly before the first big storms rolled in. In summer we get credits through energy not dollars, and any surplus we put back into PG&E’s system gets credited as energy, not dollars, for the times we are not producing. This solar power system will zero out our electricity bills within a year, saving us at least $10,000 per year in costs – and more as energy costs continue to rise over time. A big thank you to everyone who has helped with this incredible venture, and if anyone would still like to be involved with the project to help meet the final costs of installation, please contact the project coordinator Dave Picciotto.